This creek side and coastal brush shrub is a semi- drought tolerant, tall "shooter", with leaves that are similar to those of Maples. The flowers are a dazzling shade of pinkish red, setting to delicious blue-black berries that are sweetist in the late spring. 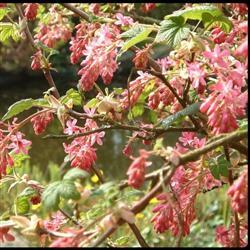 This bush can be interplanted with Ribes indecorum to create a colorful, canyon hedge.